In Newport Beach Table Tennis Club no matter the number of people we have to make a tournament. We respect your time and effort to come and play. So as policy we never cancel our Equal Challenge Tournament. Mohamedali Mukadam against David Yashar, this match was intense both players give their best in each point. After the match was over both shake hands showing great sportsmanship . Congratulation guys, great match to watch! The third place was for Mohamedali Mukadam, he lost just 2 matches. Nothing bad for first time, hopefully we’ll see you again! The second place was for Kuei Chen, our Asian friend who always give the best in each point. The first place was for Hamed Ettehadi, our Iranian friend who is an offensive player. Congratulation Hamed Ettehadi, you are legible to play for our Equal Challenge Jackpot, now is in $302. Can Hamed win for a second time in row? Come this Wednesday and find out if he can do it. 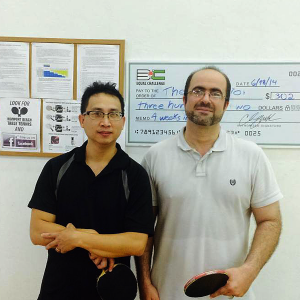 Come and challenge our Equal Challenge Champion at 6:30 pm in Newport Beach Table Tennis Club. See you this Wednesday for more table tennis! Kuei Chen Recovery His Equal Challenge Tittle!